This summer, the YMCA Achievers branch at the Egleston Square Youth Center, in partnership with the Latino STEM Alliance, helped promote a summer of STEM (Science, Technology, Engineering and Mathematics) to Boston teenagers. Over the summer, 13 teens learned how to build a robot, and then how to program it to perform specific activities. After six weeks of construction and programming, the Y teens - as team Egleston Y Elysium - competed in a city-wide robotics competition held at Dudley Square Library. Even though they didn't win the competition, teens were happy about the performance of their robot and how they overcame challenges. 13-year-old Moses Morales Perea of Dorchester echoed the thoughts of many of the other participants when he said, "I did not know if I would even like it at the beginning, but the more time I put into the robot's programming, the more I wanted to see my creation succeed." As the summer wound down, 75 of our campers received a special invitation from YMCA General Board member and Citizens Bank Vice President Michelle Hecht to visit the Rose F. Kennedy Greenway Conservancy Carousel prior to its Labor Day weekend grand opening. Inspired by the imaginations and drawings of Boston public school children, Newburyport Massachusetts based sculptor Jeff Briggs created life-like characters that include 14 different animals native to the land, sea and air of Massachusetts. The carousel is open to the public daily - learn more online. We were pleased to partner once again this year with the Summer Fund to provide 16 children from local homeless shelters full scholarships to YMCA day camp programs. Whether they came for one week or the entire summer, for these children camp provided stability and a comforting routine free from the stresses that accompanying living in a homeless shelter. The Summer Fund also supports our summer camp programs at the Ponkapoag Outdoor Center, at the East Boston YMCA and our campership program with the Boston Police Department. Together, we are are ensuring that all Boston children have access to enriching summer experiences. YMCA Young Professionals (YYP) is a new group created by Y staff for individuals ages 25-35 from the Greater Boston community to join in socializing, service, networking, and professional development. YYP's kick-off event is planned for September 26 at The Whiskey Priest in the Seaport District. More details about the group and how to get involved are available on YYP's Facebook page and online. 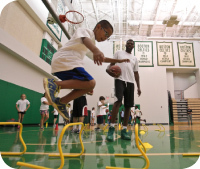 Last month, Sun Life Financial sponsored an NBA Fit Clinic at the Waltham practice facility of the Boston Celtics for youth from our Waltham and West Roxbury Ys. Sean Hanrahan, head coach of the men's basketball team at Warner University in Central Florida, Celtics guard MarShon Brooks, Celtics assistant coach Walter McCarty, and former Celtics standout Dana Barros led the 35 kids through a variety of basketball drills and spoke with them about healthy eating. The purpose of the event was to encourage physical activity and teaching kids that a healthy lifestyle can be fun. Wes Thompson, President of Sun Life Financial, was greeted with cheers and high fives from the kids. Celtics players led kids through basketball and conditioning drills, showing them that exercise is fun. Operations Director Donny Bautz and Executive Director Jack Fucci celebrated Rudy Graceffa's 100th birthday at the Y. Longtime YMCA member Rudy Graceffa celebrated his 100th birthday on August 18 with staff and fellow members at the Waltham Y. Although Rudy is legally blind, he enjoys exercising and loves coming to the Y a few times each week to stay fit. Rudy says that he usually comes into the Y feeling 99% but he feels 100% when he leaves. He feels lucky to be so healthy at his age, with no aches or pains, and he credits regular exercise for his success. Jim Hennigan is owner of James W. Hennigan Insurance Agency in West Roxbury and a volunteer with the Y for 18 years. 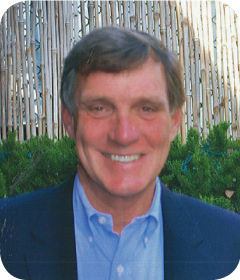 He currently serves as the Chair of the West Roxbury YMCA Board of Advisors. My wife and I enrolled our daughter in Scamper Camp when she was three years old for her first day camp experience, and I was extremely impressed with the dedication and level of caring of the staff. As a board member, the Y has given me an opportunity to involve myself with some of the most dedicated people I have ever met. 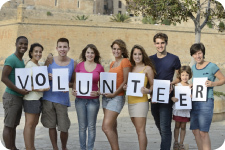 Whether they are staff or other volunteers, these people care about what is happening in the lives of not only the members, but also other people in the community. I have seen the West Roxbury Y make dramatic differences in the lives of many people, and I am very proud to be part of this great organization. What are some of the current challenges the Y is facing? I am passionate about the West Roxbury YMCA's current capital campaign after seeing first-hand all the outstanding programs and services the Y offers - but also knowing that due to a lack of accessibility, we are not serving everyone in our community. Our present facility is a barrier to participating in Y programs for many folks with physical limitations. I am thrilled that state Senator Mike Rush and state Representative Ed Coppinger are supporting our planned renovations and that the state has appropriated $500,000 in support of this project. I'm looking forward to the groundbreaking later this year, and I'm excited that our new facility will be better able to serve our current members and attract new families to the Y. In your opinion, what is one of the greatest impacts the Y has on the Greater Boston community? The staff and volunteers of the Y make a real difference in the lives of the people they serve - from the youngest child in day care to the seniors participating in exercise classes and everyone in between. The Y is an organization that truly cares and makes a lasting and positive impact on families and individuals. I know of no other organization that has such a profound effect on people's lives. 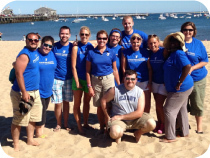 For the second year in a row, the YMCA of Greater Boston's GLBT Employee Resource Group helped sponsor Family Week in Provincetown this summer. Staff members from the Y and Family Equality Council collaborated throughout the year on trainings and workshops and developed a strong partnership in the process. In addition to being a sponsor of this year's event, the Y supplied staff to assist with babysitting one morning. Family Week, sponsored by Family Equality Council, is the largest gathering of GLBT families at one time anywhere in the US. Hundreds of families come from around the globe to take over Provincetown for a week each summer. Family Week has been taking place for the past 18 years, and was primarily started to create a sense of community for families with GLBT parents. "Familes and staff alike were thrilled to see the Greater Boston YMCA represented at Family Week," said Ally Kuriloff, Programs Associate for Family Equality Council and one of the lead staff members for Family Week, "not only because of the great show of support for families with GLBT parents that their presence demonstrated, but also for their invaluable help. We could not have pulled off such a seamless first day of activities without the enthusiastic participation of the Y volunteers." Frankie Winklaar has been a member of the Hyde Park Y for 10 years. As owner and head barber at Los Magicos Barbershop in Hyde Park, Frankie truly has his finger on the pulse of the community. As part of a truly special community collaboration, on August 29, Frankie offered to give free haircuts to any teen involved in the Get Summer program at the Hyde Park Y, to help them get ready to go back to school. Frankie believes in the kids in our community and says, "If I can do a good thing for these teens, they can then do something good for someone else." In all, Frankie and his crew gave free haircuts to more than 40 YMCA teens in only 5 hours. 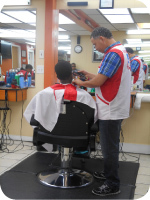 JoJo, one of the other barbers at Los Magicos, said, "This is the least we can do for the teens here in Hyde Park. They're all good kids - some of them just get a bad rep because they're from the city."